I’ve lived in Maryland all my life and had never heard of Unionville, a small community on between St. Michaels and Easton. It is linked to a touching Civil War story – a story of “after-war” success of those facing the greatest challenges for survival. During the Civil War Harriet Tubman and Frederick Douglas – both natives of Maryland’s Eastern Shore – consistently urged President Lincoln to allow Blacks to fight for their freedom. When Lincoln established the Colored Troops, many African Americans – both free and slaves – signed with the Union Army. Many were killed or maimed. When the war was over, most had nowhere to go. Former slaves were homeless and free Blacks had difficulty fitting back into communities. 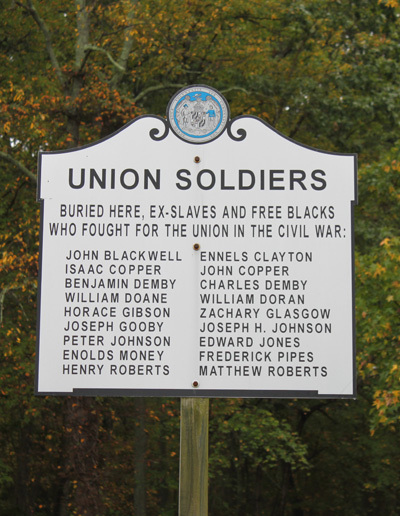 Eighteen slaves and free Blacks from rural Talbot County, Maryland were a part of the Colored Troops in the Union Army. They were discharged in 1866. Ezekiel and John Cowgill – Quakers who owned Lombardy Plantation in Talbot County – carved out a parcel of land for these soldiers. They offered each one of the eighteen a plot of land for a dollar a year. All eighteen settled there and built a community, starting with a church and a school. They named it Cowgilltown after their benefactors. The community grew – most being descendants of these eighteen men. Later, the community was renamed “Unionville” after the common thread that stitched the founding inhabitants together – fighting for the Union, standing for freedom. All eighteen are buried behind the church they founded – St. Stephens AME. Church. Their graves are well looked after, each decorated with a small American flag. Around Unionville’s founders rest their descendants, and the community is still intact. Graves of the Union Colored Troops from Talbot County lined up in the rear of the graveyard. There’s a peace about Unionville Cemetery. Wandering through it amidst the graves of people connected by a call for freedom, even the old trees seem to be smiling. It was heartening to find a spot where African American heritage – especially from this period in time – is celebrated with joy, pride, and optimism, marked not only by stone memorials but by a living continuation of a community that thrives today. Unionville Cemetery is located on the Eastern Shore in Talbot County, Maryland. From Route 50 take the Easton Bypass (Rt. 322) to the St. Michaels Road (Rt. 33). Turn Right on Unionville Road (Rt. 370) and follow into the small community of Unionville. Church is on the right before Tunis Mills Road. Also nearby – The historic Towns of St. Michaels and Easton, and the Chesapeake Bay Maritime Museum.